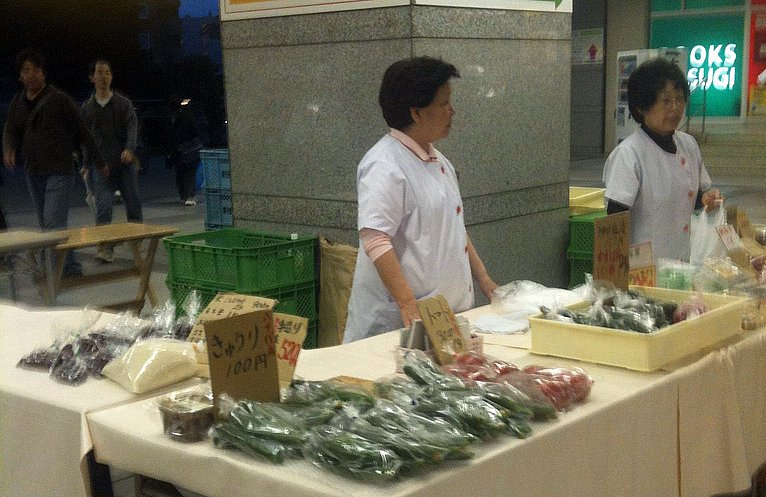 Farmers try to sell local food at a train station in Yachiyo city, Chiba. Yachiyo is suffering from high radiation despite government urging people that produce and milk are safe. Putting all the politics and feelings aside for a moment and looking at the day to day routines of life, I ask myself, "What measures can be taken to reduce the intake of this poisonous radiation? What ways can we avoid exposure to these potential harmful elements?" We have air born radioactive particles that can be avoided by staying indoors or wearing a mask, hat, and protective clothing to some extent. This does not entirely prevent exposure but only reduces it. But if it is done daily it can make a difference in the long run and that is the big issue. Radiation can have grave consequences in the long run and it is something that stores up in the environment and our bodies daily, year after year. So I think the mentality of "long term" needs to be taken when trying to combat this invisible enemy called "radiation." Taking conscious effort to make changes in our life style choices can help reduce the daily risks we might be undertaking. Certain vegetables that are mineral rich can be very toxic if the mineral elements are filled with radiation. Hence the warning for spinach, usually a very mineral rich leafy plant. Also milk from cows is quite mineral rich that is why it is thought to be healthy to drink and is provided at schools in Japan (but that is debatable even without the risk of radiation). Rain water, soil and plant life soak up radiation and in time it becomes concentrated so it is important to keep children away from puddles of water, exposed soil or plants. This is quite difficult to do since children naturally want to play and interact with their environment. So the best thing to do is wash hands, feet, and hair as soon as you get home from a trip outside, especially if it was the park! Children gathered at a local park in Funabashi, Chiba Japan. One of the biggest ways to fight radiation is with diet. Obviously diet cannot combat acute radiation poisoning and the nasty side effects of a massive radiation dose but it can keep radiation from storing up in your body. The intake of mineral rich foods from safe sources helps prevent toxic minerals from being absorbed. In Japan the traditional diet already consists of many of these mineral rich foods like seaweed, nori, kelp, miso, hijiki, agar, and many other ocean plants. Also beta-carotene loaded vegetables like leafy green vegetables, green beans, asparagus and Brussels sprout help in the fight on the cellular level . Radiation is a natural phenomenon, but in regards to nuclear power also a very dangerous one. It is a game of numbers and chance, as your body`s cells interact with millions or even billions of radioactive particles every day. It is best to fight radiation with healthy living but also be aware and know your limits. However, the truth of the matter is, unfortunately for some people in Japan evacuation is not an option. Ugh, just wishing everyone the best. Radiation IS a natural phenomenon, it's what we've done to it to make it dangerous. And like you say, at the atomic and sub-atomic level everything is a numbers game. It's also worth noting the effects from this radiation won't be felt tomorrow or the next month or even next year but in the decades to come. hey! Just move back to USA! We could have tea!